New to Bidsquare is MNP Auctioneers from Kuala Lumpar, Malaysia. On January 26, they will be holding their sale of Straits Chinese Antique Auction. This auction consists of 63 carefully selected objects that include porcelain, textiles, and jewelry. Straits Chinese, also known as Peranakan Chinese, are descendants from Chinese immigrants who moved to the Malaysia region during the 15th to 17th Century of the Ming Dynasty. Over the years, they adopted their own distinctive customs and culture that incorporates local traditions. The Chinese porcelain featured in the MNP sale was produced during the Late 19th Century specifically for the Straits Chinese. These objects tend to feature much brighter colors than Chinese domestic ware, and can be distinguished by a mostly pink, turquoise and yellow palette. The designs also tend to feature more phoenixes, songbirds and florals. All of these porcelain wares were for domestic use by wealthier families. One of the top items from this auction is lot 63, a pair of famille rose dragon and phoenix vases. These vases are exceptional for their large size and wonderful depiction of a dragon on one vase, and a phoenix on the other. The dragon/phoenix combination traditionally symbolizes the emperor and empress, but in a domestic setting, they can represent husband and wife. Both mythical beasts designed are featured on a very attractive sky blue ground containing large peony blooms. This pair of vases is estimated at RM 55,000-RM 100,000 (approximately USD 13,000-USD 24,000). Another interesting Straits Chinese porcelain ware from the MNP auction is lot 49, a famille rosekamcheng. 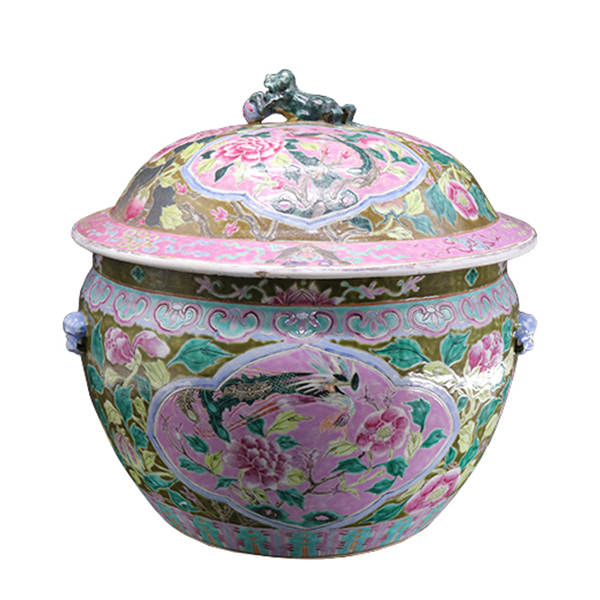 A kamcheng is literally a covered pot and would have been used by wealthy families during special occasions including anniversaries, weddings and birthdays. This particular example has an estimate of RM 35,000-RM 75,000 (approximately USD 8,400-USD 18,000) and features large phoenix and peony medallions on a rare olive green ground. The cover is surmounted by a small finial of a lion-dog. 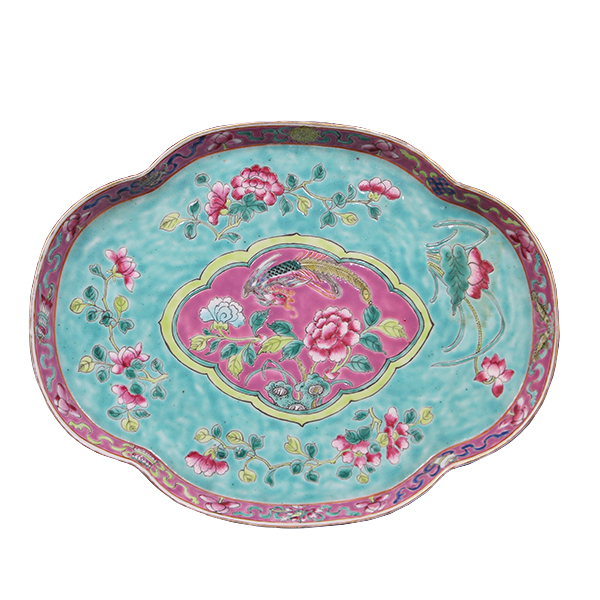 Lot 45 is another rare example of Straits Chinese porcelain. Like the other objects in this blog, the main design of this ceremonial tea tray contains a phoenix and florals. 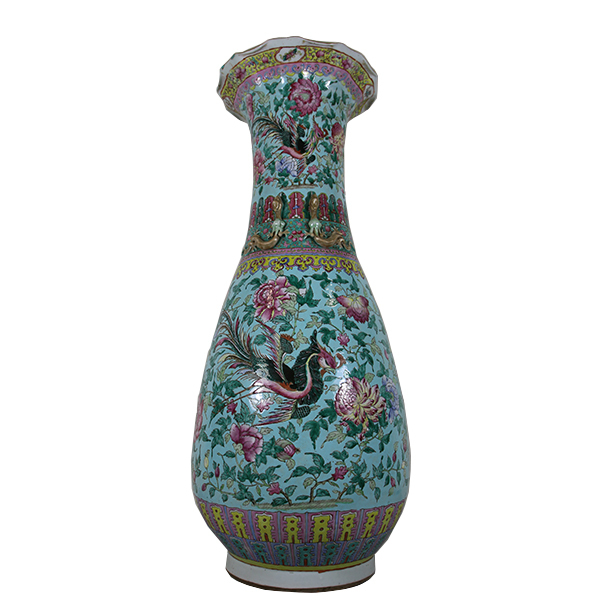 In this case, the central medallion is on a more typical turquoise green ground, and contains numerous peony sprays. With a length of 11 inches, this is an extremely rare and large size. Most collectors for this category would find this tray quite attractive, especially since it is conservatively estimated at RM 7,000-RM 12,000 (approximately USD 1,700-USD 2,900). Finally, the MNP Auctioneers sale also offers a selection of Straits Chinese jewellery and accessories. One that stands out is lot 23, a kerosang serong set. A kerosang is a set of three brooches (typically a larger oblong-shaped brooch and two smaller rounds brooches) used to fasten a lady’s traditional formal dress. This particular kerosang is delicately constructed of silver and shaped like a leaf. 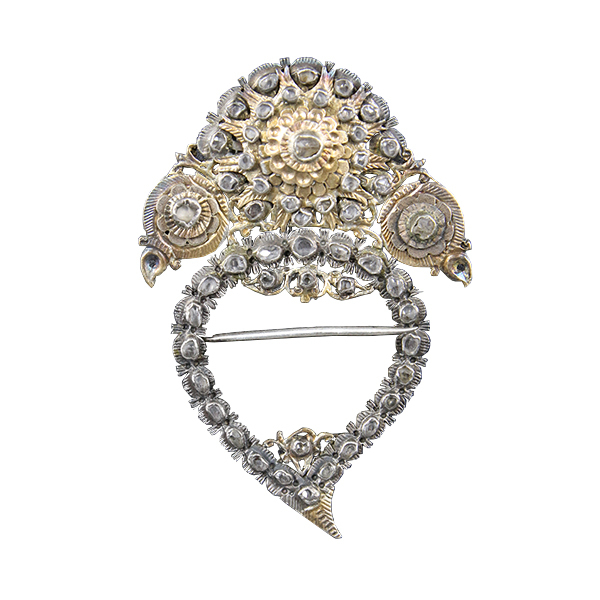 The detail of floral rosettes throughout the brooch is gilt highlighted and mounted with multiple diamonds. It is estimated at RM 1,800-RM 2,500 (approximately USD 430-USD 600). Click here to view the full catalog of MNP Auctioneers sale on January 26th. Anthony Wu is an Asian Art consultant, researcher, writer based in Toronto, Canada. After working eleven years as the Asian Art specialist at two of Canada�s largest regional auctions, he started his own art advising firm where he consults for various auction houses, museums, and private clients in Canada and the USA. He is a certified Chinese Fine Art appraiser with the Appraisers Association of America.